While I was working on the ruffled flower pattern I thought that when it was all fluffy it would make a good scrubbie done in larger scale. So I made one in a similar style, just a bit more ruffly but still just one layer. I think I used one ball of yarn total, but it may have been slightly more then that. It's done in worsted weight cotton with a size H hook. If you use a size G I'm sure you can do one with one ball of Sugar'nCream or Peaches & Creme yarn. 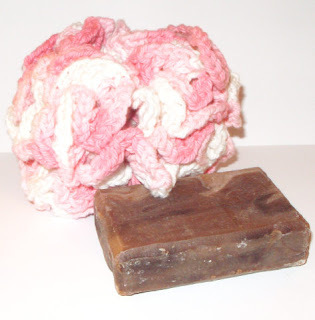 The soap in the picture is a bar of cold processed Vanilla Bean soap from SingingWolf Soaps. More on that after the pattern. This is a very simple pattern, and the scrubbie, made out of cotton isn't really scrubbie but it's nubbly and feels good to shower with. With a size H hook, chain 40, slip stitch in first chain to make loop to hang it from. Round 2-4: Sl st to first ch 1 sp, ch 4 (counts as first dc and ch 1), dc in space, ch 1, dc in space, ch 1, dc in space, ch 1, * in next space, dc, ch 1, dc, ch 1, dc, ch 1, dc, ch 1* repeat ** in each space around. Slip stitch to join round in 3rd ch of first ch 4 of the round. After you've done 2 more rows the same way, you've got a lot of increases and it gets very ruffly and ball like. When you join the final round, break off and weave all ends in. It's pretty quick to make. If you use acrylic yarn or anti-bacterial yarn instead of cotton, I think it would work just fine in the kitchen as a dish scrubber or tawashi. Becka, the creative mind behind SingingWolf soaps sent me a box of her soaps knowing that I'm a real soap junkie. I love artisan soaps that are mildly superfatted and made with all sorts of good oils for my skin. Her soaps are lovely to use and my children and I have been using them since we got them. I've noticed I don't have to use lotion as often while using her soaps, and they work well on my hair with a vinegar rinse afterwards. I can't recommend them enough. My husband uses Dr. Bronner's Peppermint and doesn't think clean is clean without a tingly feeling and she's working on formulating a soap for him and his love of his peppermint. Actually, my daughter "borrowed" my bar of English Rose and I wound up trading a bar of Dragon's Blood with her to get it back. I love love love rose scented soap. You can find an almost complete list of free patterns for crochet that I've posted in the past here or by checking out my Ravelry page on the right. Off to make scrubbies as soon as my wrist allows me to crochet again!